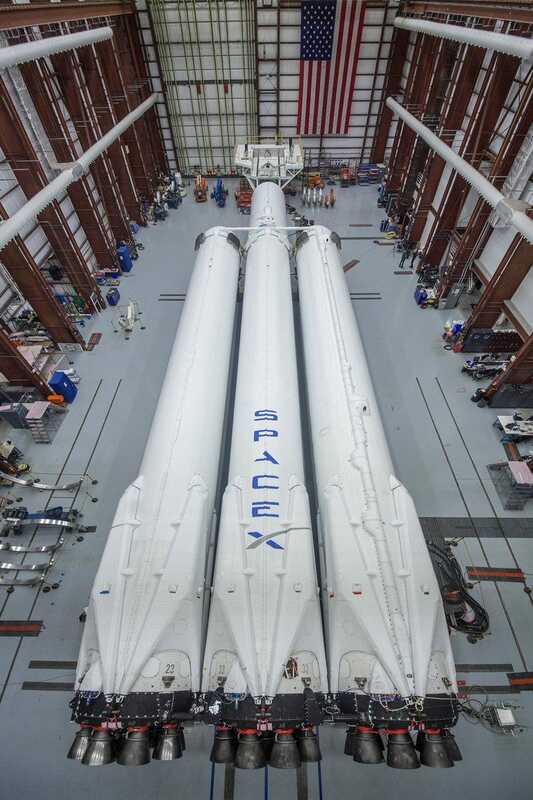 Elon Musk/SpaceX via TwitterSpaceX’s three-booster Falcon Heavy rocket in a hangar at Cape Canaveral, Florida, in December. 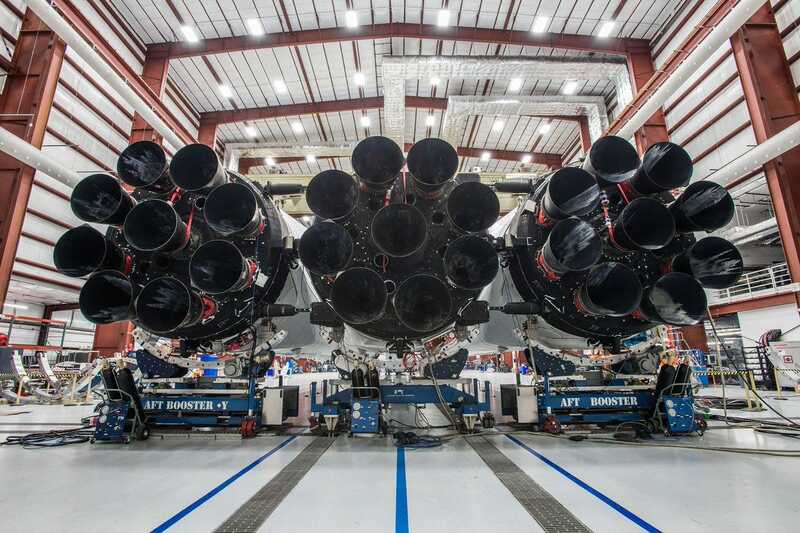 Elon Musk posted new photos of SpaceX’s soon-to-launch Falcon Heavy rocket. Falcon Heavy will be the most powerful rocket ever built by the aerospace company. The system uses three boosters that can land themselves after helping loft a payload to space, then be reused – expected to save millions on launch costs. The rocket may be powerful enough to send human missions to the moon and Mars. Elon Musk is gearing up for the launch of Falcon Heavy, the biggest rocket system ever built by SpaceX, his aerospace company. SpaceX says Falcon Heavy is the most powerful in the world today – and to whet the appetite of fans around the world, Musk posted three photos of the 230-foot-tall rocket on Wednesday. The shots show the system inside a hangar at Cape Canaveral, Florida, the place from which Falcon Heavy is supposed to launch in January. 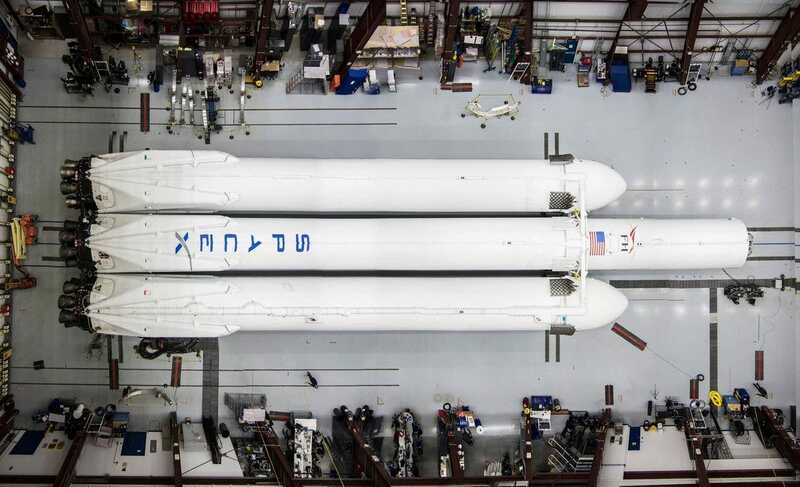 “Falcon Heavy at the Cape,” Musk wrote in a tweet that included three photos of the nearly fully assembled rocket. Elon Musk/SpaceX via TwitterThe rocket in the hangar. Falcon Heavy uses three boosters nearly identical to the ones on Falcon 9, SpaceX’s workhorse rocket system that can loft satellites, supplies, and space capsules into orbit above Earth. But by using three boosters in a special launch sequence, Falcon Heavy will have enough thrust for much bigger payloads – even human missions to the surface of the moon or Mars. Also like Falcon 9’s boosters, Falcon Heavy’s can land themselves to be reused in the future. “If things go perfectly, all three rocket booster cores will come back and land. Sides back at the Cape, center on the droneship,”Musk tweeted on Wednesday. But Musk acknowledges there’s a good chance his new “monster rocket” may not make it far from the launch pad. 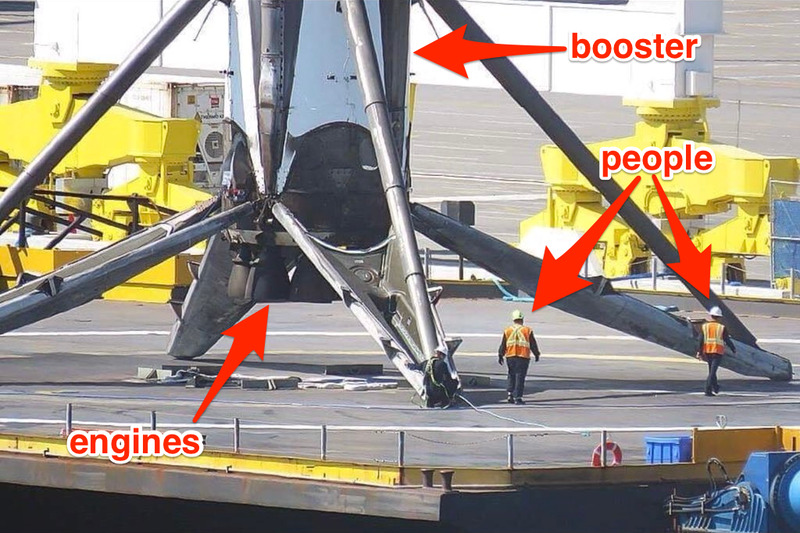 SpaceX/Elon Musk via Twitter; Business InsiderThis shows the scale of a Falcon 9 rocket’s self-landing booster. Rocket parts can cost tens of millions of dollars, yet they are typically trashed after launch and never recovered – so this could be a game-changer for the cost of access to space, especially when it comes to going beyond Earth. Such launches also typically cost hundreds of millions of dollars, but SpaceX is pricing Falcon Heavy at roughly $US90 million, depending on the payload and the destination a customer wants it to reach. Falcon Heavy won’t eclipse the awesome might of the now retired Saturn V rocket, which NASA used in the 1960s and ’70s to send Apollo astronauts to the moon. But the new rocket is in a similar league, as it can send a payload about half as heavy into low-Earth orbit. However, the maiden launch of Falcon Heavy is considered experimental, and Musk has not been bashful about the possibility of failure. SpaceX/Elon Musk via TwitterThe Falcon Heavy rocket.